Color A, cast on a multiple of 10, + 9 sts. Row 1 - RS: Color A. knit. Rows 3, 5, 7, 9, 11: Color B, k2, * sl 5 wyif, k5; rep from * to last 7 sts, sl 5 wyif, k2. Rows 4, 6, 8, 10: Color A, purl. Row 12: Color B, p4, * p1 uls, p9; rep from * to last 5 sts, p1 uls, p4. Row 13: Color A, knit. Rows 15, 17, 19, 21, 23: Color B, k7, * sl 5 wyif, k5; rep from * to last 2 sts, k2. Rows 16, 18, 20, 22: Color B, purl. Row 24: Color A, p9, * p1 uls, p9; rep from * to end. 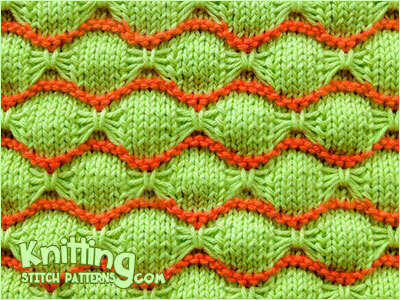 SL wyif: Slip stitch purlwise with yarn in front. P1 uls: Purl 1 under loose strands. Insert left hand needle down through the 5 loose strands below next stitch, purl these 5 strands together with next stitch on needle.